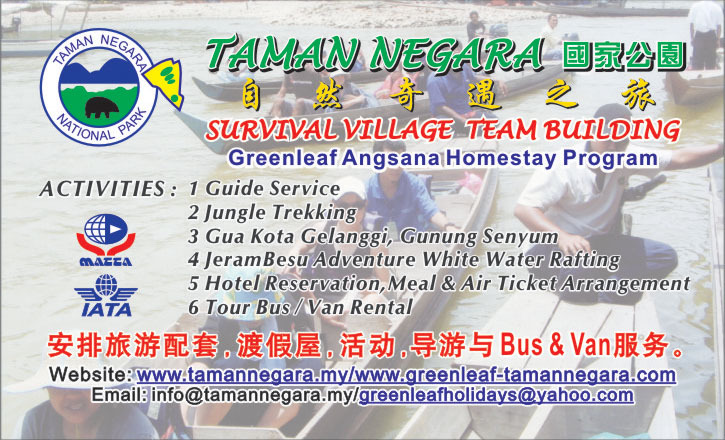 Taman Negara is accessible via Jerantut which is the main entry point to the Park. You will have to take either private or public transport from Kuala Lumpur or Kuantan, and it takes approximately 3 to 4 hours from these points to Jerantut. Taxi and bus services regularly ply this route from the Kuantan main bus terminal, or the Pekeliling Bus Station. 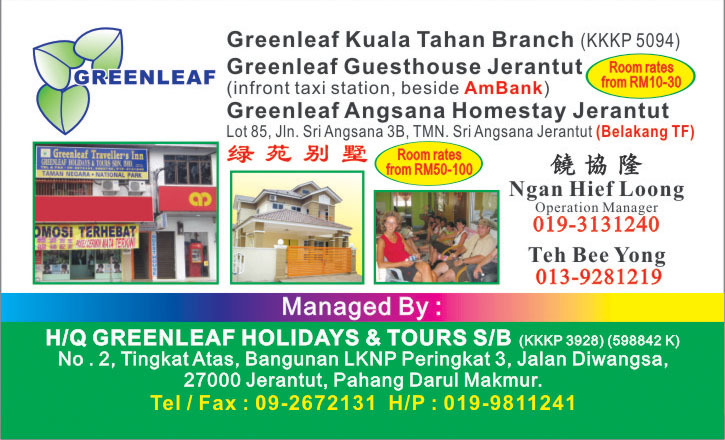 From Jerantut, a 16-kilometre ride in a bus or taxi brings you to Kuala Tembeling. From here, simply follow the signs to Taman Negara. From Singapore, a night train brings you right to Tembeling Halt, and from here you can walk to the jetty, which is about half an hour away. From the Tembeling Halt Jetty, the Park’s headquarters at Kuala Tahan is a 2.5 or 3.5 ride up the Tembeling River. This boat ride may cost between RM 35 to RM 150, depending on the number of passengers. A word of caution before you begin your Taman Negara adventure - be sure to get all the necessary permits and licenses from the Department of Wildlife and National Parks in Kuala Tembeling Jetty. These are available for a nominal fee. Boats depart from Kuala Tembeling at 9 a.m and 3 p.m daily. 1. The weather is generally hot & humid all year around. The temperature ranges from 25°C to 33°C. 2. Most approciate clothing for the jungle are loose fitting cotton long sleeved shirts and long pants to help keep the insects at bay. 3. A jacket or cardigan is handy for early morning excursions. 4. Wear comfortable boosts or sneakers. 5. Bring along a torchlight for night walk and Gua Telinga (Ear Cave) explorations. 6. Insect repellent and first aid kit are recommended. Please bring along torchlight, cotton T-Shirts, bermuda / loose shorts, swimming suits, trunks, sneakers / jogging shoes, insect repellent & water bottle. Personal items such as towel & toiletries are NOT supplied for budget accommodation at Tahan Guesthouse, Teresek View, Agoh Chalet, Durian Chalet, Ekoton Chalet, Liana and Tembeling River View.As such, please bring them along. For the chalets at Mutiara Taman Negara Resort, toiletries supplied.